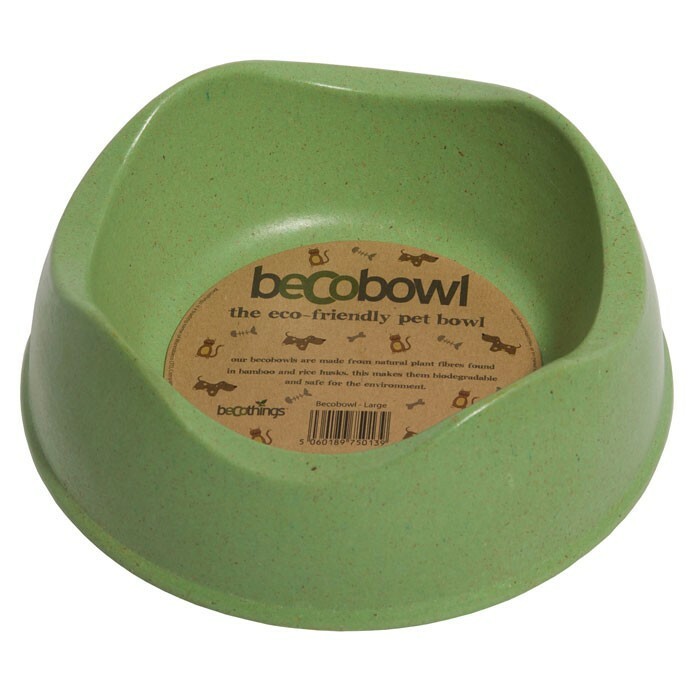 I suppose it was an inevitable progression in the forward motion of recycling that someone would take it to the next level… I’m talking about biodegradable pet bowls. Honestly. I’m not lying. Okay, so if someone asked me where I thought recycling is going, my first thought wouldn’t have been “that’s obvious, how about biodegradable pet bowls and litter scoops!”. Made by Becothings, the items themselves aren’t made from ceramic or plastic, they’re made from waste plant fibres and personally I’m rather fascinated by how they managed to hash up a dog bowl (or cat bowl, litter scoop or feed scoop for that matter) from a plant. Apparently, they grind the plant fibres into a fine powder, add a biodegradable resin, and press the lot into a hot mould to make the bowls and scoops. It’s not the most obvious bowl-making material but it really seems to work. They use bamboo and rice husks leftover from farming so the waste-conscious among us can breathe a sigh of relief that our pets are eating out of bowls made from materials that otherwise would have gone to waste. And we can rest easy knowing we’re using en eco-friendly scoop to clean up the cat poo. Bonus. Being made from natural materials it therefore means the bowls and scoops are biodegradable and can be added to that mountainous muck heap (sorry, compost heap) in the garden when you get fed up with it. My New Year’s Resolution? To find a yoga class and lose my spare tyre… but when I fall off the wagon in February, I’ll get myself a Becobowl and do my bit for the planet instead. Raw Feeding – For Cats!